"Over the course of a lifetime, perhaps one of the most complex, mysterious, and--if the people involved are fortunate--sustaining emotional and psychological relationships within a family is that between siblings. 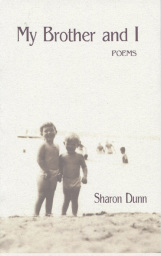 In these twenty-six sometimes painful, always honest poems, Sharon Dunn explores this terrain and honors what she finds there. These are love poems in the most encompassing sense of the term." to dry his hairless animals. difficult gardens of her childhood, which is explored in the first half of the book; in the second, "the dark that is home" in childhood is movingly resolved through involvement with her own family. knives. "Knives like this one?" are in the dark men in my family. Yet I believe he is the son of light. keep horses, fly his own plane. nor redeem us, nor pity us.